A garage door is substantial in size and can have an enormous amount of weight. This being said, you would never want someone in your family to be harmed by the garage door. In 1993 garage door openers officially had to have safety sensors installed. Let’s say you push the button to close your garage door. If anyone or anything was passing under it would just keep going with all the weight of the garage door falling unto the person under. Nowadays, thanks to the motion sensors the garage door will stop right where it is and move in the opposite direction. This feature alone helps an unbelievable amount should a child or small animal happen to cross signal that the garage door sensors produce to help keep the garage door safe. Be sure to let your family know to not play around with the garage door remote or around the garage door. Accidents can happen and the best way to avoid them is to not create a situation where the issue could arise. Another way to ensure security is to properly maintain the garage door. Lubricating the tracks as well as the springs and cables can help ease the movement of the garage door while it’s opening and closing. Cleaning can also help both with the longevity and safety of the garage door. 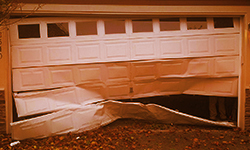 Garage doors have features to help with safety and some there are some common sense solutions to help increase safety.